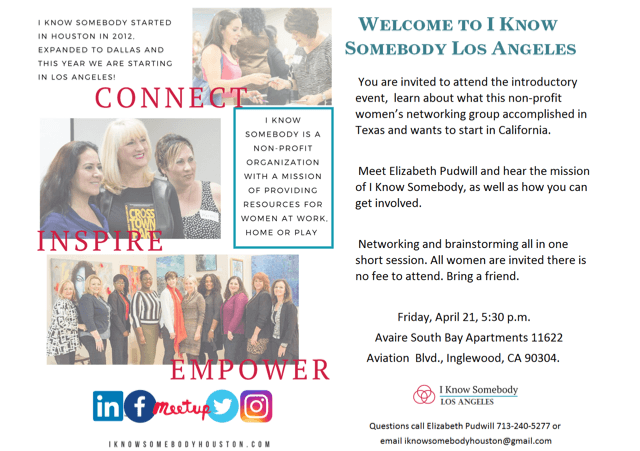 I Know Somebody Los Angeles (IKSLA) is a non-profit networking group for women. IKSLA aims to provide resources to women at home, work or play. Join us for the first I Know Somebody Los Angeles Event! Who: Founder of IKSH (I Know Somebody Houston), Elizabeth Pudwill, + Owner of Fit Armadillo, Catherine Basu + hostess Terri Cleveland of Aviare South Ba﻿﻿y + You + Other amazing ladies of Los Angeles and South Bay (please invite your friends-there is NO FEE to attend!). What: Networking + Brainstorming the next steps for this non-profit women's networking group as it expands to it's newest location, Los Angeles! 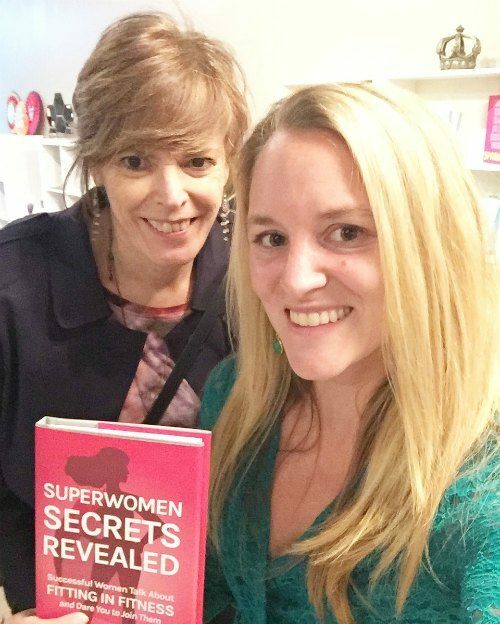 Why: To learn about I Know Somebody, connect, inspire, and empower one another! RSVP: We'll have some light bites and refreshments available. Please RVSP H﻿﻿ER﻿﻿E so we'll know to expect you and your guest(s). If you can't come this month, but want to know more, please send an email to Catherine: Catherine@FitArmadillo.com requesting to be added to our mailing list. #WomeninBusiness -RSVP for the newest #NetworkingGroup in #SouthBay #LA that supports you at work, home & play! I Know Somebody Houston and its founder Elizabeth Pudwill played a huge role in my success as a new entrepreneur in Houston, Texas. When I was approached by Elizabeth after one of the events on my Houston, TX Book Tour to see if I'd like to be a part of the non-profit networking group's expansion to Los Angeles, it was truly an honor and a definite YES!!! I'm so excited to help bring this group to LA and that you'll get to meet Elizabeth this month. I look forward to meeting you and connecting, inspiring, and empowering each other at the kickoff party and at future events!